Hello Sunshine! 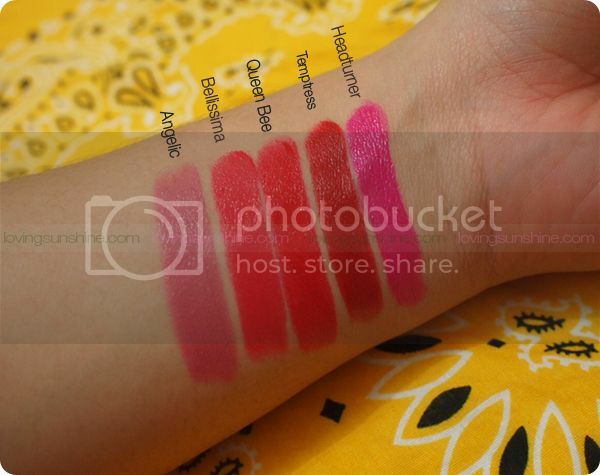 Let me quickly share with you swatches of my Colour Collection lipsticks. Both online and in real life, I always rave about my Colour Collection lipsticks because they're super amazing and pigmented and creamy and just divine--may I just say??? Click to learn more about Colour Collection makeup. 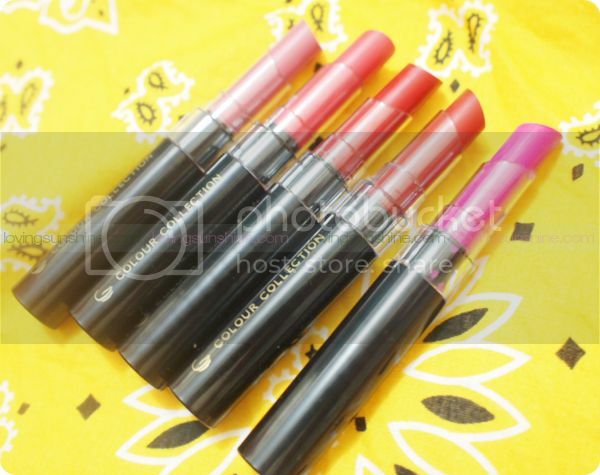 It was Sample Room who introduced me to Colour Collection cosmetics. And I'm ever so grateful to have tried their products before ever committing to them. Thanks to the power of "try-vertising", my adventures in beauty are fail-proof! Now, that's my type of investment! Here are the swatches for my Colour Collection lipsticks. My top favorite is Angelic because it's super wearable. I love its dusty pink color, and I also love mixing it up with my loud pinks, to help mute them down. Angelic is truly worthy of its product name because it's a very soft-spoken shade, but it really commits an endearing hue that can complement the Filipina skin tone to its finest! If you're looking for something to enhance your makeup without going over the top, Angelic would be a great shade. How about you, which is your favorite among the 5? I think in life, it's very easy to fall trap to the safety of a "comfort zone". I'm not shaming people who are square or would rather stay within this space, I think it can sometimes be a very principled way of life; but lately I got into thinking, how do you balance the two? When do you know if it's time for seeing comfort, or time for taking risks? For this, I want to quickly share my working life principle. I say working because this might still change as I myself change as a person; and also, because it's really what I live by. In life, stressors will always come and go, but the important thing is to have a center where you can really evaluate your actions, thoughts, and even your plans for the future. I think when it comes to balancing comfort and risks, it all boils down to doing what you should to get what you want with minimal risks of harming the world around you. Of course I remembered to share this principle because I also saw The Fault in Our Stars advanced premiere last night and I still am very impressed by how Hazel Grace lived a life that left the least damage. I think it's very respectable and if I may say, difficult to live gracefully and kindly especially when it's so easy to strive for a life that is all about making our own names shine up on a pedestal.